We celebrate the 45th anniversary of the Apollo 11 mission by asking, should we return to the moon? We discover what scientific knowledge is still to be gained by going back, what robot missions are being planned as part of the Google Lunar X prize, and do commercial companies hold the key to funding research? Plus, in the news, the electronic lables that can be printed by inkjet, the genes which control how good you are at Maths, and can elephants cry? Is maths and reading ability in your genes, or does it come from your upbringing? Is being brainy in your genes, or does it come from your upbringing? The true answer lies somewhere in between. And thanks to a new study we're getting closer to teasing apart the complex relationship between nature and nurture. Across the world scientists have been studying thousands of twelve-year olds to try and find genes involved in maths and language skills, and have come up with a surprising result - there's actually a substantial link between the genes involved in reading and maths, so if you're genetically gifted at one you're likely to have genes that make you good at the other. Robert - People may be surprised to know but it's no longer interesting to ask that question, 'is it heritable?' because every single study over decades has shown that it is heritable. So, we're trying to go beyond heritability and one of the most interesting questions is to ask, are the same genes affecting different traits? Because you might expect something like reading is very different from math because the cognitive processes involved in doing math and reading would seem to be so different. So, you would expect that although they're both heritable, different genes would affect the two skills. Kat - So, you've got a maths gene that means you can add, subtract, juggle numbers in your head, and a reading gene that means you can kind of focus and understand words. Robert - Yeah, except most definitely what's come out of the molecular genetic work on DNA is it isn't one gene. We're talking about hundreds or maybe thousands of genes of very small effect. So, the question is more quantitative - to what extent are the different genes that affect reading, overlapping with the genes that affect math. The punchline is that although you might very different genes to be involved, in fact, most of the genes are the same. So the take home message is, genes make you similar in reading and math and all these cognitive abilities. The environment makes you different. So, the reason why kids are better at one thing than another is probably down to environment which is kind of a hopeful message in a way. Kat - Going to the links between reading and maths, why do you think this might be? We do talk about numbers as words as well as actual kind of numerical concepts. Is that the same kind of process going on in the brain there, you think? Robert - Well, in terms of cognitive processes and attempts to get at the functional MRI, the way in which you measure how the brain works through imaging, they do suggest there are different processes involved. And at a cognitive level, the sorts of thought processes we use to solve problems, I agree you use words to describe numbers, but it does seem to be very different cognitively. The thing is though, they all use the brain. Although we think of the brain, in neuroscience, very often as modular, this bit of the brain does that and this bit of the brain does that. From an evolutionary perspective, you might really expect that the brain is a general problem solver and it solves problem in reading, it solves problems in math and spatial abilities. So, to a large extent, the general problem solving ability of the brain comes into play even in processes as different apparently as reading and math. So, that's what I think is involved. Kat - So, knowing with these things that you found, the information you've got that reading and math abilities seem to be linked, what next? Robert - Well, we're going to continue trying to find the genes. There's a lot that's still happening. But I think just at the level we're at now, if there are any parents who still think children are a blob of clay that you just mould to be what you want them to be, tabula rasa - the blank slate, they might pay attention to these data and realise that kids aren't just moulded to be what you want them to be. Maybe as parents and teachers, we need to recognise that children differ even very early in life, and maybe respect those differences to a greater extent. It doesn't mean if it's genetic, you can't do anything about it. If you have a child who's reading disabled, it doesn't mean you can't help them to read. It's just going to take a lot more work than some children who just almost naturally start reading. So, you got to roll up your sleeves and say it's going to take more work. It's not the fault of the schools or the teachers, or the parents, or that the child is lazy. Some children just find it much more difficult to learn than others. And these new data suggest it's kind of a general thing. It isn't just they have problems with one thing. If they have problems with one thing, on the average, they're likely to have some problems with most things. So, that means you have to pay attention to that and not just blame schools, teachers, and parents, which is what we tend to do. Imagine waving your smartphone over your shopping basket and the oranges telling you when and where they were picked, the pills in your doctor's prescription confirming that they are in-date, and even the bank notes you'll use to pay for the shopping authenting themselves. Mark - We've all heard about radio frequency identification tags known as RFIDs they've become ubiquitous over the past decade. They're used to track goods, contactless payment cards like Oyster cards in London. They're used in passports and loads more. Chris - How do they actually work, Mark? 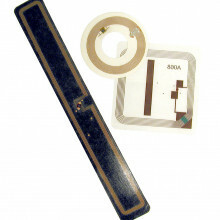 Mark - You can either have a passive RFID tag which basically picks up a radio signal and uses that to generate a current inside the device, and that current then is used to send a signal back to a receiver, and it sends some information, "I'm a load of cargo that started off in Singapore a week ago, and this is where I've been sent." Other ones are actually powered by batteries and they tend to be able to send signals over longer distances and carry more information as well, but they're a lot more expensive. People have been trying to create much cheaper tags which they call eLabels that can be printed onto any surface using just an inkjet printer. And now, a team in Sweden has created the first printed eLabel that can communicate directly with a smartphone. Chris - So, this is intriguing. You can actually print a circuit with ink. Mark - Yeah, that's right. Essentially, a diode is what they're printing and that's built up using tiny particles of silicon locked into a sort of polymer slurry and you can print it out using an inkjet printer. You hook that diode up to an aluminium foil antenna and a flexible polymer display, and when you wave a smartphone over this device, the high frequency radio signals from the smartphone are picked up by the antenna, channelled into the diode, and that moves electrons around in the diode and generates a current. That's used to illuminate the polymer display. So, the smart phone signal is being used as an energy source. Now, this is a proof of principle. In the future, the researchers say it should be quite possible to use that energy to send a signal back, carrying information back to the smartphone so that you're passing on details about whatever this eLabel is stuck to. Chris - Wow! So, you could for instance print a bank note and print into a bank note some circuit similar to this and this would mean that if someone wanted to say, authenticate a bank note to prove it wasn't a forgery, you could just wave your phone over it. The energy just from the phone radio waves coming out of the phone would drive this. Mark - That's exactly right and that's actually why this team started working on this. They were working with a British company called Delarue which is the world's largest bank note and passport manufacturer. They wanted to make a security code that could be printed into bank notes. In theory, yes, a smartphone held close to this bank note would be able to identify the eLabel in it, and that might hold information about the origin of the note, how long it's been in circulation, and so on, and that should be very difficult to counterfeit. Chris - This is almost like a fusion between cash and card or electronic transactions. You've actually got money with a memory, potentially. Mark - Potential for this goes a lot larger. The researchers are saying that this is a key component - this diode - in what you would need to actually build an internet of things. Now, this is a concept that's been talked about for a few years that will basically see pretty much everything connected to the internet. You can sort of see why connecting your fridge to the internet might be useful. It could monitor when you need to order more food from the supermarket for example and just do that automatically for you. But what about connecting paper magazines to the internet, or an orange? I mean, if you have an eLabel stuck to an orange, you swipe your phone over it and it tells you where it was picked, how long it took to transport it from wherever it was picked. So, the idea is that you can achieve these sorts of things if you can get cheap enough eLabels to do this. That's what this printing technology allows you to do because it literally is just inkjet printed onto a surface. US government this week discovered vials of smallpox virus whilst cleaning out an old storeroom. · Smallpox is caused by the variola virus, and is spread by direct contact with infected bodily fluids. · The symptoms include fever, aches and the spots or 'pox' that give the illness its name. · In the past, the disease killed a third of all infected adults, and up to 80% of children. By the end of the eighteenth century, in Europe, this meant the death of 400,000 people each year, including five kings. Many more were left blind. · While there is no known treatment, vaccines can provide lasting immunity. 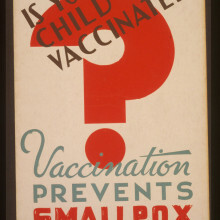 But using the live smallpox virus as a vaccine was dangerous, as people could become ill and die. · In 1796, a doctor called Edward Jenner discovered that giving people a dose of cowpox left them with immunity to smallpox. This made the vaccination process much less dangerous, as cowpox was a much milder illness. · Vaccination was so successful that the number of cases dropped dramatically, and by the 1970s, vaccination was no longer necessary. · In 1979 WHO certified that smallpox had been eradicated, and began a global effort to keep track of the remaining stocks of the virus. By 1983, all known stocks had been destroyed, or brought to one of 2 holding centres- in Atlanta and Russia. · In 1990, the WHO recommended that these last two known stocks should be destroyed, to prevent accidental release. · Some scientists, however, argued that they should be kept. They believe we need to understand more about the viruses in order to protect ourselves from possible bioterrorism. · Another fear is that the virus could re-emerge naturally, perhaps from melting perma-frost. If we no longer had the sample, we would be unable to create new antiviral drugs. · At the moment, two advisory groups to the WHO disagree about whether the remaining virus should be destroyed, so the decision has again been delayed while a third advisory group is set up to discuss the matter. Every year, millions of us end up locked to lavatory seats for longer than we'd like owing to something we ate. But tracking down the sources of these food-borne illnesses is extremely difficult. It usually takes Public health officials months to carry out detailed interviews with victims, as well as conduct laboratory tests, to try to isolate the bugs responsible; and even then the culprit can sometimes escape identification. 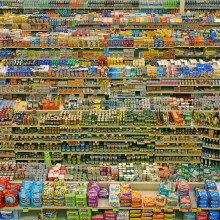 Now, computer scientists at IBM's public health department in California, have discovered a way to use food sales information collected by supermarkets, together with reports of disease outbreaks, to pinpoint the sources of food-poisoning within days of the outbreak, potentially preventing thousands of people from becoming ill.
James - The technique combines sales distribution for different products that might be available from a retailer like a large supermarket. With public health case reports, these are confirmed laboratory reports. So, you know that an outbreak is happening and you know where the case reports occurred, comparing those locations with the sales distribution for different products, it's possible to calculate the probability that each product in turn might be responsible for the outbreak or might be the contaminated product. So, you calculate that product probability for every product and then you can use statistical techniques to determine the most likely suspect product set. And that set gets smaller as the number of case reports increases. Surprisingly, after as few as 10 case reports, that set size is small enough that you can actually test them all. We think that the paper is going to be interesting to, not just the public health community but also to the retailers; to the private companies that sell and distribute food because outbreaks lead to huge economic losses. So worldwide, the cost of food borne disease is about $9 billion a year in medical cost. But the economic losses due to lost sales of, in many cases, perfectly good food is over $75 billion a year. So, there's an economic incentive for the food retailers to take advantage of the data that they already have and they can proactively calculate sales distributions over time. Then when an outbreak does occur, they can use that to see if something in their inventory is involved in the outbreak. Chris - Can you see that they might see this as a disadvantageous thing to do because if something does occur and it's on their patch, it's their fault potentially, this could have medico-legal and insurance implications. And so, wouldn't it better for them to remain under the radar under certain circumstances? James - It's actually quite the opposite. So, we've talked to some of the big retailers in the US and they're very open. They have websites where they inform people about all of the recalls that are underway for different types of food, whether their products are involved. If you think about it, a supermarket is a victim. They're receiving food ingredients, grocery items from all over the world. If one of their suppliers provides them with food that's contaminated, not only do they have to dispose of that food of course. If there's an outbreak, they may have to dispose of all salad products. In Europe in 2011, European farmers, the losses was over 150 million euros because they had to discard a wide variety of salad products. There was an outbreak but they didn't know the cause. They just knew that it was salad. Chris - Why do you think that no one has done what you've managed to do at IBM before now because it's not rocket science, is it to tie geography with sales volumes and pin that on a disease? James - It's not rocket science. It was however, surprising. The reason the method works is that there are differences in the pattern of sales for different products. One might intuitively think that the grocery sales will be so uniform. How could you possibly tell one food from another? But in fact, for the majority of products, there are significant differences. And so, that's the essence of how the method works, so that was what we studied in the paper. 17:40 - Can elephants cry? A conservation group published an image of an elephant that appeared to be crying - is that possible? Earlier this week a conservation group published an image of an elephant they had rescued. The animal appeared to be crying - some said with relief and joy - prompting the pictures to go viral. Victoria - This is a story that seems to have captured the public imagination all around the world actually this week. A conservation organisation called Wildlife SOS reported that they had rescued an elephant called Raju who had been treated appallingly for apparently 50 years. He'd actually been sort of passed from pillar to post being kept as a begging elephant. He was chained in these horrendous shackles that had spikes on them around his legs that produce very nasty wounds. This was in India. He was in very terrible condition. He was very, very thin and this conservation organisation, the good news story is that they rescued him. But the story that really captured the imagination was this picture of Raju after he was rescued that appeared to show this big streak that looked like a tear running down his face. And so, this conservation organisation and lots of news outlets reported that this elephant had wept with joy. I'm not sure there's any evidence to support that. Chris - So, you're saying that it is exclusively humans that cry. Victoria - It seems to be, yeah. I think what we've got here is a case of convenience and probably quite campaigning anthropomorphism. Elephants actually, like a lot of mammals, apart from the mammals that live in water have these lacrimal glands that produce this sort of aqueous - the liquid part of our tears. Our eyes, in order to move around in our sockets and be bathed and protected and protected from bacteria as well have to be constantly bathed in this fluid. And so, lots and lots of these land dwelling mammals produce tears. And actually, elephants are really interesting because they have lots of glands around their eyes that produce different liquids, not just the kind of salty, aqueous tears that we produce. Young males when they're in what's called 'must' which is a kind of high testosterone, very sexually active period, this hormonal response will actually make them produce even more of these secretions. If you go to a safari park, if you go to a zoo, you will see what look like tears streaming down their face, but there's no evidence at all that these are emotional tears, that they're crying like us. That seems to be an exclusively human physiological thing. Chris - I think there's also some evidence that according to what mood a person is in - human - the composition of their tears changes too. So, there's a difference between emotional tears, sadness, happy tears, and eye-watering because you've got something in your eye type tears. Victoria - Yeah, there is. I mean, still actually a lot of mystery, kind of evolutionary mystery surrounding why we actually produce tears. I mean, it's something that puzzled even Darwin. There's a really nice book called "Why humans weep." It's a really interesting book and it sort of talks about how our crying actually changes as we mature. Babies and small children are very, very vocal in their crying. As we go to maturity, we will cry very quietly and just produce these tears. What he suggests is that that kind of silent weeping is actually a protective mechanism because if we can show to our social group, our family group around us that we're distressed and we need help, but not call out and make an involuntary sound, that means that the predators won't be able to hear that we're in distress but will be able to give a signal to our group that we need some help. Chris - Indeed because some people suggest that because so much of our brain - I think a third of, our brain is given over to decoding what we're looking at, we've naturally evolved to have very visual signs of how we're feeling whereas other animals including elephants, they tend to have much better developed senses of other types. And so for them, a physical visible signal like a tear running down their face would be quite literally lost in such a huge area of a face that probably would be less useful to them as a signal. Victoria - Exactly and with animals whose sense of smell, whose other senses as you say are so much more important to them. Interestingly, we don't seem to be the only animals that will cry as in cry out because if you define crying as an emotional response to distress that might be a vocal response, we've seen that in elephants. We've seen what seems to be collective grieving even. So, there've been observations of elephants gathering around the bodies of deceased elephants in groups. There've been different responses from the different animals in that group and some appear to rock their bodies in response which sounds, anthropomorphising again, like a very human-like distress-like response, that sort of rocking. So, we may well not be the only animals that cry. In fact, we don't seem to be, but we're the only animal that produces these emotional tears, and there's still so much evolutionary mystery around that. Chris - So, how has it gone down then, your analysis of the fact that the elephant probably wasn't really crying? 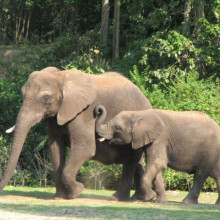 Has it been well-received or have people shed a tear or two over the fact that elephants don't seem to cry? Victoria - I think I managed to dampen the nation's spirits by sort of bringing in a little bit of what I thought was quite interesting, sort of actual animal behaviour observation - a bit of ethology, a bit of science into it to just say, "Well, no. there's no evidence of this" but the physiology of elephants and actually, all the glands around their eyes is really interesting. So certainly, this elephant was producing tears but they weren't emotional tears. I think there was a little bit of not letting science get in the way of a good story there I'm afraid. 23:52 - What is the Moon made of? One of the greatest legacies of Apollo 11 is the 383 kilos of moon rock that the astronauts lugged back to Earth. What have they taught us? This week marks the 45th anniversary of the launch of Apollo 11, the mission that first set mankind on the moon. Since that first landing, a total of 12 people have now walked on the moon at 6 different landing sites. Together they have travelled nearly 100km across the lunar surface, and deployed over two tonnes of scientific equipment. But one of the greatest legacies of these Apollo missions is the 383 kilos of moon rock that the astronauts lugged back to Earth. Sara - When I was a child, I remember the Apollo mission. At the time, my friends got excited about almost everything, but this is the first time I'd seen my parents and other adults looking genuinely amazed and excited about what was happening, and that made me really think this is something so special. Graihagh - And in front of us is one of those samples from one of those lunar missions. Can you tell me a bit about how this rock came to be here? Sara - The president at the time, President Nixon, actually gave a small piece of moon rock to every country around the world. Graihagh - Just looking at it, it's about thumbnail size and it's encased in a big glass marble. The rock itself is actually quite black, but I always thought the moon looked quite grey. So, why is it so black? Sara - Yes, so if you look up to the moon in the sky, you can see most of it is a white colour and it's white because it's made mostly of one mineral called anorthite. It's thought that when the moon first formed, it was entirely molten and then as bits started to crystallise, the lighter crystals floated to the top and they happened to be white. But also, if you look up at the moon, you can see it's got big dark blotches on it. And these, we think formed by later volcanism. So, it could be that this rock is a piece of this later volcanic activity on the moon. Graihagh - So, what have the lunar samples told us? Sara - The lunar samples have told us so much about the moon. Before the Apollo missions, we had no idea how the moon formed, so there were lots of different theories. One theory was that it could've co-accreted with the Earth so they could be kind of twin planets, or it could have spun off the Earth if the Earth was spinning really fast, or it could be an asteroid that the Earth had captured. Really, there were loads of theories floating out there and it was only after people have brought rocks back that a consensus emerged that actually, the moon formed by - this story that's even more amazing than any of those, which is that there was a giant impact of this Mars-size body into the early Earth then material was splattered off which then accreted to form the moon which was very hot to start with and then cooled down slowly. Graihagh - I believe you've done some work yourself specifically on some lunar samples as well and it's all to do with water. Sara - Actually in the early days, when the material was brought back from Apollo, the scientists remarked on how dry it seemed. But now, 45 years on, we've discovered that actually, instead of being bone dry, the moon actually did contain water. We can see evidence for that in little minerals called apatite and then at the Open University, my student Jessica Barnes has looked at the isotopic composition of the water to try and determine exactly where it came from. If you look at the very primitive samples, actually, the water looks very similar to the Earth. We think the sources of water on the moon and on the Earth are probably actually asteroids and also micrometeorites that are continuously bombarding the Earth and the moon especially in the early history of the Solar System. Graihagh - Does that mean there's no water there now or could there be some water locked away? Sara - Yes. Well, as well as our work on the solid samples that we have here on Earth, people have been using spacecraft in orbit around the moon to look at the presence of water. There are places on the poles of the moon that stay cold all the time. We think now that these areas might actually have water ice. So, it looks like actually the moon might be a fairly good source of water which could be exploited for example if there's ever a lunar base. 28:55 - Should we mine the Moon? Today many countries are competing to return to the Moon, including China, Japan and India. But what are they all racing for? The Apollo samples allowed scientists to understand just how rich and diverse the Moon geology is. But these samples have only (literally!) scratched the surface and now the race is on to get back to the moon. Unlike the so-called 'Space Race' of the 1960s between Russia and America, today many more countries are competing, including China, Iran, Japan and India as well as a host of private companies. But what are they all racing for? Chris - What actually do we understand about the moon's origins? David - Well, Sara was talking about what we call the 'Giant Impact Theory' for the lunar origin and that emerged in the first decade after Apollo, where if you look at the isotopic composition, the oxygen isotopes and so on, of lunar and terrestrial material, it looks like they're formed from the same stuff. So, this theory arose that there was a collision, a body like the Earth, a body may be Mars size. They were both differentiated and they had iron rich cores and rocky outer layers. They're on their way to being planets, but they bumped into each other and that's the last stage of planetary growth. The core of the incoming body carried on and joined the Earth's core, but the rocky outer part of both - parts of it was fragmented and thrown to orbit around the Earth and re-accreted into this hot body which was molten, as Sara said, there was magma or ocean and the first forming crystals rose to the surface to give us these pale and anorthite-rich lunar highlands. The moon almost lacks an iron core because all the iron from the original body joined the Earth's core. So, that's why the Earth and moon are different in composition, but isotopically, they're so similar. It looks like they're formed from the same stuff. The best idea is this giant impact which is being challenged lately. It's not done and dusted. It might be wrong. Chris - When you say the isotopic composition, in other words, the flavours of chemicals that we find here on Earth's surface are such an exquisitely close match for what's on the moon that it sort of hints that one coming from the other, they're both made of the same stuff. David - There are three different flavours of oxygen, they look so similar. But recently, it's been pointed out, actually, they're not absolutely identical so maybe this giant impact theory has some flaws in it. Chris - But what do those lunar samples tell us the moon is made of? What's up there that may be of use to us now or in the future? 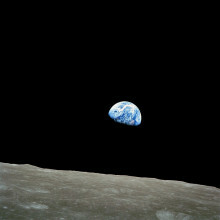 David - Geologically, the moon is nowhere near as diverse as the Earth. If you have a lot of water in a planet, you can have a lot of geology going on - melting from granite and concentrate ore minerals, and so on. That hasn't happened on the moon, although there maybe some traces of water, it's very small beer really. So geologically, the moon is perhaps less diverse - you're not going to go to the moon and form a gold rush. But the one thing on the moon that you might want to bring back to the Earth is something called helium 3 which doesn't even belong to the moon, it's come from the solar winds - helium nuclei streaming out from the sun that get splatted into a lunar soil and just held there. It doesn't make it to the Earth's surface because of our atmosphere and our magnetic field. Helium 3, you could use as a source of clean nuclear energy. You can fuse helium 3 with heavy hydrogen and get cheap nuclear power. It's never yet been proved, that it can be done economically. But if it can be, then fetching helium 3 from the moon to the Earth would be a way to do it. But it costs money to get stuff from one planetary body to another. If you want to use the moon's resources, you're better off - I would say, using them to do things on the moon or in space. It costs a lot to get out from the Earth into orbit, so get stuff from the moon to use in space. Chris - Here on Earth, we're acquainted and familiar with the concept of mining. We generally find areas which are in enriched in certain minerals and we dig there to get them out. Would we see a similar sort of structure on the moon, or is it distributed all over the moon and so, it would be very difficult to have a mine for whether it's helium 3 or some other thing we wanted? David - Helium 3 would be pretty uniformly distributed. Most mines on the Earth, we've had water circulating through the crust, concentrating stuff into places which makes it economical to dig a tunnel to get to it. That's unlikely to happen on the moon. With the one exception that's come to my attention is sites where a metal-rich asteroid might have formed a crater on the moon. These metal-rich asteroids carry platinum group elements, platinum, palladium, iridium, and so on. If you can find that asteroidal material in or around a crater, you might want to go mining for it. But mostly I suspect is scavenging across the lunar surface. Chris - So, the bottom line is that, whilst there may well be things up there the cost of recovering it to Earth is likely to be pretty preclusive and therefore, would it be better to say that it's more likely we would want to use it in situ? We'd want to establish some kind of operation on the moon and use it there. David - I think we are going to want operations on the moon and it'll be very important for the economics of doing anything on the moon that we can use as many of our local resources as possible because to lift stuff off the Earth to the moon is very, very expensive. We need a cheap way of getting to the moon and back. Chris - Do we know where the resources are? Has anyone done a sort of mapping exercise of the moon to spot which the juicy bits are to make a beeline for? David - Well, everywhere on the moon is regolith, padded rock which you can make habitats out of and shield yourself from radiation. There are craters near the poles which never receive sunlight which do have water in them. It's not the same water that may have been with the moon when it formed. It's water that's arrived with comets hitting the moon. Most of the water when a comet hits is vaporised and the molecules will bounce around. If they hit a hot surface, they'll bounce again. If they go to a cold surface like a shadow inside a crater where it's -150 centigrade, they will stick there. If that crater is at the poles so the sunlight never peers over the crater rim, the floor will be at 150 degrees permanently and the water molecule will stick there. And there is 5% ice that's been proven now inside some polar craters. If you went to lunar base and want to provide water for astronauts to drink or for use in industrial processing or to make into rocket fuel, you get it from inside these polar permanently shadowed craters. That's the one resource that's been located in concentration, water. It's not just commercial missions which are considering a trip to the Moon: many scientific missions are being planned as well. 7 years ago, Google announced their Lunar X initiative: a 30 million dollar prize fund to reward anyone who could send a robot to the moon, move it 500 metres across the surface and beam back footage for us earthlings to enjoy. There are now 18 teams in the running and, with any luck, some of them be blasting off moonwards in the next 18 months. Anita Heward from the Google Lunar XPRIZE spoke with Kat Arney. Anita - First of all, I just want to clarify that the prize money has been put up by Google. So, they put up this prize purse of $30 million, but the prize actually operated by XPRIZE which is a not for profit foundation which puts up these prizes for to encourage all kinds of technology breakthroughs for mankind. Kat - So, with these lunar robots, who's building them and what are they up to so far because 18 months doesn't seem a long time away to me? Anita - No. So, they've had since 2007 and obviously, they've had quite a challenge because with the financial crash, raising the money is one of their biggest hurdles, particularly raising the money for the launch vehicle. But as you said, we've got 18 teams in the running and they come from all over the world. We've got 4 based in the US, 1 in Canada, 2 in South America, we've got 6 in Europe. So actually, Europe is doing quite well with this, sadly, not in the UK. No teams in the UK. We have teams in Israel, India and Japan, and Malaysia. So, we've got a very global spread and they come from all kinds of different backgrounds. I mean, it's very interesting for me, having come from the scientific community, having a certain set of people. But I mean, the people that are involved in the XPRIZE comes from all kinds of different backgrounds. We've got teams that are led by architects, people that come from software engineering backgrounds. So, it's a very different perspective and all of them have one thing in common which is to set up some kind of business which involves going to the moon. Kat - So, people around the world, they're making these robots. They're presumably going to have to launch them in some kind of way. How do you go about getting a rocket onto the moon? Do some people have strong plans for this? Anita - They do and it's a big challenge. Within the 18 teams, we have quite a broad spectrum of ways of approaching that. We probably have about half a dozen that are actually aiming to do the whole mission. So, they're securing their launch slot and getting into lunar orbit and then landing on the moon themselves, and then deploying their robot. Their robot doesn't have to actually rove 500 meters. It can take off and fly again or it can roll. Kat - Just battling it out up there. Kat - This does sound absolutely brilliant. I mean, it is an impressive challenge and one of the things in it is they have to be beaming back videos. So in theory, in 18 months, we could have MoonTube coming to us. Anita - That's right. I mean, the images that we have actually from the surface of the moon, the Apollo images that are so familiar to us, they're all a bit grainy and 1960-sy. 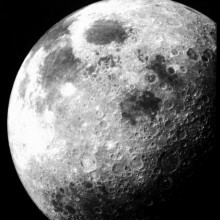 What will be exciting about, what we'll see back from the Google Lunar XPRIZE teams is that, that will be real high definition imagery of the moon. They have to send back a panorama, they have to send back video of their journey, traveling 500 meters, and of wherever have they end up. And so, you'll see an up to date view of the moon, a high definition view of the moon which hopefully, will kind of give you a better perspective of what is actually like to be there. Kat - Not a great party. There's not a lot of atmosphere, I've heard. Maybe you could tell me about maybe one of the most exciting or the most intriguing things that you've heard one of the teams are up to. What's hot in this field? Anita - So, the team try to do different things. We have teams that their long term business goal is to set up infrastructure on the Moon. So, to setup networks of power and communications so that then the opportunity for what you can actually do on the lunar surface then becomes much broader, much greater so for mining water and exploration. You can then deploy a whole load of little rovers that can go and explore. But we also have teams that are looking at going to lacus mortis - the lake of death, where we've discovered recently, the Japanese satellite Kaguya in 2009 discovered that there were these lava tubes underneath the surface of the moon. There are these caves that you can actually get down into them. We have two teams that are looking to go to this area where they will actually go and explore these caves. They're Astrabotic and Hakuto our Japanese team, and the Japanese team has got this incredibly cool dual rover which has a big rover called Moonraker and a little rover called Tetris which is going to actually abseil down into the cave on a tether and then do some mapping underneath the lunar surface. So, I mean, that will be a whole new view of moon. Kat - This is for serious science and exploration. It isn't just for laugh and YouTube videos, isn't it? Anita - No, absolutely. They are looking to do exploration that hasn't been done before. Another team, Moon Express is looking to deliver a precursor optical telescope to the south pole of the moon. I mean, there is so much opportunity for the science community with this sort of new commercial access to the moon that rather than having to wait 10 years for a space agency to develop a mission and then have it cancelled at the last minute, you can actually just go out and pay one of these teams to take your instrument there within a few months. 41:01 - Who owns the Moon? We heard all about grand plans to further explore the lunar surface and to mine the moon, but who, if anyone, has the right to do so? This week we're celebrating the 45th anniversary of the Apollo 11 mission, which took humans to the moon for the first time. Ian - Nobody owns the moon. 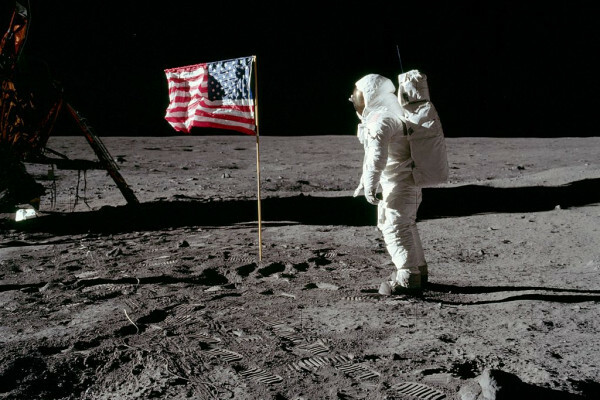 The legal status of the moon is currently governed by the 1967 Outer Space Treaty and this treaty prohibits nation states from appropriating the moon by planting flags on it or claiming sovereignty. So, under current international law, nation states are not permitted to own the moon. But there is an ambiguity because when the '67 treaty was formulated, no one envisaged private access or tourism or the Google XPRIZE, or anything like that. So, it is true that these commercial endeavours are not really dealt with explicitly by the 1967 Outer Space Treaty and therefore, there is a case for clarifying the legal position before these commercial activities really get underway. Chris - Have all countries in the world signed up for the treaty or are some not in it? Ian - No. Effectively all relevant nations are parties to the Outer Space Treaty. The last time I checked, it had 202 states parties signed up to the Outer Space Treaty and these include all space fairing nations including China and India and Japan, and really any nation state that's in any way likely to be able to send anything to the moon is signed up to the Outer Space Treaty. So, the Outer Space Treaty is secure. It is a secure foundation for international law for lunar exploration and exploitation, but it doesn't quite go far enough because of when it was setup, none of these commercial activities were envisaged. Chris - So, if a company were to go to the moon, perhaps off the back of the Lunar XPRIZE, if they were to get there and then begin exploitation of the moon, would they be covered by legislation or would they be just capable of exploiting it to their own benefit and sell things off the back of that which they benefited from, the country they were from benefited from, but others wouldn't necessarily? Ian - So, this is where there is an ambiguity in the treaty that does need to be clarified. Currently, the launching state is responsible for the activities of any commercial entity which goes to the moon, or to anywhere in outer space. The nation state who launches this payload is responsible. So, if any of these packages - Google XPRIZE, or what not - were launched from US territory, the United States of America which is a signatory of the treaty would be expected to enforce the terms of the Outer Space Treaty and similarly, for any other launching state. 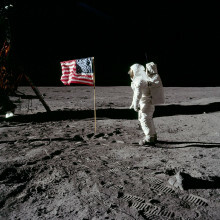 Since nation states are themselves not allowed to appropriate the Moon, the sense is that this would prohibit the governments of nation states that oversaw these launches would have to ensure that they were not seen to be appropriating the Moon and therefore probably, would impose legal impediments to having private entities do so. So, this would be a potential disinsentive to the private exploration of the Moon and I think I agree with Anita and others that we actually do need a commercial leverage here to help us explore the moon. So, I think in order to facilitate this, a revisiting of the Outer Space Treaty would be desirable so that it made clear that although no one could appropriate the moon, at least private companies that went to the moon on their own initiative, if they were able to find anything worth selling would benefit from their investment because unless these private companies have that guarantee, they're unlikely to invest. If they don't invest, we'll all be the poorer for it. So, this is one of the reasons for wanting to clarify the international legal regime that currently covers the moon. Chris - Well, you've just been writing a review on how the moon might or might not be exploited or exploitable. What points were you making in that review which hasn't been published yet. Ian - Well, I agree with David Rothery really that the Moon has very little that is so valuable that you would have to go to the moon to get it and bring to the Earth to benefit the Earth's economy directly. Helium 3 is suggested, but as Dave correctly pointed out, helium 3 fusion hasn't yet been made to function on the Earth. So, we don't even know there's a market for it. And even if there is, the Helium 3 on the moon is a finite resource. It's essentially a fossil fuel. You'd go to the moon and strip mine it and use it all up. So, it's not a long term solution to the Earth's energy needs. The other possibility are, that crashed metallic asteroids on the lunar surface might be mineable for platinum group elements which conceivably could have a market on the Earth. But it's kind of pushing it, so I do think Dave was correct that really, the economic value of the Moon, will be strongest in the context of development of lunar infrastructure itself to help explore the Solar System, to take us to Mars, to permit scientific exploration. So, lunar resources will be very important for that and in developing an economic infrastructure in the inner Solar System more generally. So, in Earth's geostationary orbit for example, if you wanted to build large spacecraft in low Earth orbit or geostationary orbit, the moon will become an economically more attractive place to get the raw materials from. Just because its gravity well, is so much shallower than the Earth's. So, I think that's the long term context in which the economic value of the moon should be seen. 46:33 - Should humans return to the Moon? o human has visited the lunar surface since December 1972 - Is it time we went back? with Anita Heward, Google Lunar X Prize, Ian Crawford, Birkbeck University, David Rothery, the Open University. Although unmanned trips to the moon are currently being planned, no human has visited the lunar surface since December 1972, and some people might say that's for a very good reason! Apart from being inordinately costly, human spaceflight is also far more dangerous than the Apollo programme successes have led us to believe. So should people return to the Moon? Anita - I really hope so. Apollo all happened before I was born and so, I've never experienced seeing somebody walk on the Moon. 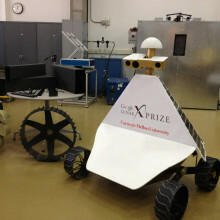 One of our goals with Google Lunar XPRIZE is to inspire the next generation of scientists and engineers. I think it's hugely exciting as we've just talked a little bit about the commercialisation; the fact that it's not just nations. It's the fact that many different people and organisations of many different nationalities can now be involved in going and exploring the Moon. And as Ian was saying, the opportunities with a Moon base for exploration of the Solar System become so much more attractive. I think we really need that big vision for exploration that really has been missing for most of my lifetime. Kat - Ian, where is your take on this? Do you think that it is worth sending humans back? Ian - Yes, even just considering science, leaving aside the possible economic benefits, just scientifically, robots can achieve a certain amount. They lead the way. They can provide the recognisance of planetary bodies. But when you want to really learn about things in-depth, I think one of the legacies of Apollo was that having boots on the ground really makes those scientific expedition so much more capable. So I mean, no doubt that by sending people back to the Moon and establishing a lunar base which you should envisage as something like an Antarctic Research Station. Just as having bases in Antarctica has permitted a lot of science in Antarctica that otherwise wouldn't happen. Having human bases on the Moon will permit a lot of science that otherwise we just won't do. So, I think absolutely. there's a very strong case for returning humans to the moon. Kat - Although the costs are extremely high and also, the cost potentially in terms of human life, do you feel that that is a tossup worth counting? Ian - Yes, I do think it's worth. Obviously, it's a balance and all exploration is dangerous, right? If you look through history, if you look on the exploration of Antarctica, a lot of people did lose their lives in Antarctica. But does that mean we shouldn't do it? Through our work in Antarctica we've learned about the ozone hole, we've learned about global warming, we worked out the history of the Earth's climate from ice cores over hundreds of thousands of years, and none of that would've been possible if we haven't established scientific outposts in Antarctica. I think if we establish similar scientific outposts on the Moon, we will learn a similarly large amount of information about our place in the universe and we can't know what it is because if we knew the answers, it wouldn't be exploration. It's just that by having a scientific infrastructure on the Moon, I think it's a little likely to lead us to learn much more about the Solar System and our place within it than we will learn otherwise. And yes, I do think that's worth spending the money on and I do think it's worth taking an informed risk to the risk of individuals who would man such research stations. Kat - So David, what's your take on this? Would you imagine yourself being a moon pioneer? What do you think the next stages are to get men and/or women back on the Moon? David - Well, I'm too old now. I do remember Apollo 11. I was 13 at that time. It was tremendously inspirational and it will be again next time we get people there. But if I can put my gloomy geoscientist's hat on, we can't stay on this planet forever. If we want our species to survive, we need humans living in space as well. Every 100,000 years, we get a volcano which kills off the world's crops. We can't have all our eggs in one basket. We should be thinking ahead to the future. So, scientific exploration on the Moon, science bases it's a step towards sending people out to live on the Moon and Mars, and in space eventually. We're going to want to do that, aren't we? Kat - I guess so, but what kind of timeframe could you envisage a small lunar colony being established? David - It depends I think on the commercial world these days. When Apollo landed, we said we'd have people there in 20 years' time. It hasn't happened. It always seems to be 20 years into the future, but it could have self-sustaining lunar colony there in 20 years if we put our minds to it. I'm not saying we're going to have mass emmigration from the Earth to the Moon, but we could have people living there in a long term basis; at least as long term as people now live in Antarctica. 51:07 - Is warp travel possible? 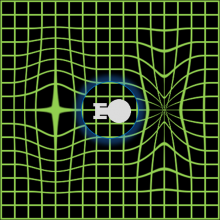 Previous Is warp speed possible?